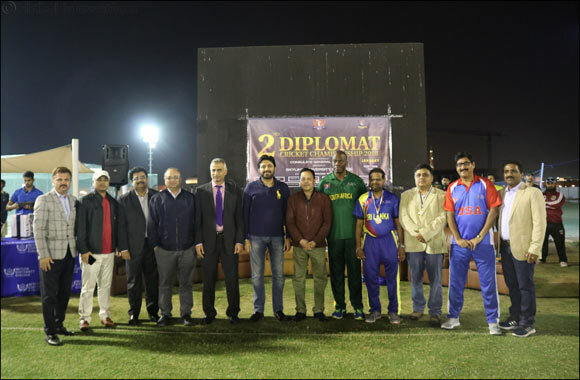 Dubai, UAE, January 21, 2018: Following the success of the inaugural Diplomat Cricket Championship Cup last year, under the permanent patronage of Consulate General of India-Dubai, Skyline University College has organized its second edition hosted by Consulate General of Bangladesh on January 19-20, at SUC cricket ground. The CG of India beat CG of Sri Lanka by 44 runs making them the new champion of the 2018 tournament. The Consul Generals who were actively involved in the tournament as players of their respective teams were H.E. Charitha Yattagoda of Sri Lanka and H.E. Mogobo David Mugabe of South Africa. Also present during the 2-day sporting event were Consul General H.E. Syed Javed Hassan of Pakistan, Consul General H.E. S. Bodiruzzaman of People’s Republic of Bangladesh as well as consulate representatives of India, USA, and Afghanistan. The Diplomat Cricket Championship Cup is a sporting event organized solely for the purpose of bringing together various Consulate General Offices in the UAE on a weekend of entertainment, networking, and building comradeship among diplomats. The participating consulates this year are: Consulate of India, Consulate of South Africa, Consulate of Bangladesh, Consulate of United States of America, Consulate of Sri Lanka, Consulate of Afghanistan, and Consulate of Pakistan. The SUC team led by Executive Director and COEC Mr. Nitin Anand along with Deputy Director and Head of Marketing and Creative Communication Mr. Rakesh Gaur and Sports Department Head Mr. Sanjay Benjamin are committed to creating events and activities such as the Diplomat Cricket Cup, which aim to promote a harmonious relationship among diplomats and other dignitaries in the UAE. CGI, Dubai is the official and permanent patron of the Diplomat Cricket Championship Cup and SUC as the official organizing partner of this annual sporting event.